Until last month, Ford’s famous pony car, the Mustang, had completely passed me by. I knew all about it, of course, and not just because I write about cars for a living. Anyone with an interest in matters automotive knows the Mustang is the definitive American muscle car. Launched way back in 1964, it offers shattering V8 performance at a ludicrously affordable price. Irresistible, you’d think, yet somehow I’d never had a proper drive in one. That changed a month ago. For a two-week road trip around Ontario, I dug deep and rented a bright red Mustang GT V8 convertible. Big roads, wide open countryside, fabulous autumn weather: it could hardly have been better. I was starting to have second thoughts about the new European sports saloon I’d ordered for delivery two days after I got back to the UK. Now back in Europe, MR has travelled to Nice to drive the Route Napoleon, in the latest, special edition Mustang Bullitt. It’s a homage to the car Steve McQueen drove in the movie of the same name. And a different beast to the car I fell in love with in Canada. Fifty years after Bullitt came out, can you still expect to milk the connection? Ford certainly thinks so. The Mustang Bullitt comes in Dark Highland Green, just like in the movie (although black is an alternative). Properly, there’s just a coupe version, and – for strict authenticity – only a manual gearbox is offered. The Ford and Mustang logos have gone from the front, leaving a sinister black grille, just like the original. But there are no chrome bumpers full of dents, which is how the ’68 Mustang appears right from the very start of the film. If all this sounds rather like a cosmetic enhancement, you’re right. There are some mechanical uplifts, but they are slight, and we’ll come to them in a minute. Back to the Bullittisation, we start to stretch the limits. There’s a faux petrol cap on the rear with a Bullitt logo, a white cue ball gear knob, some red brake calipers and a tweaked speedometer that records a higher top speed (even though the actual change is marginal). 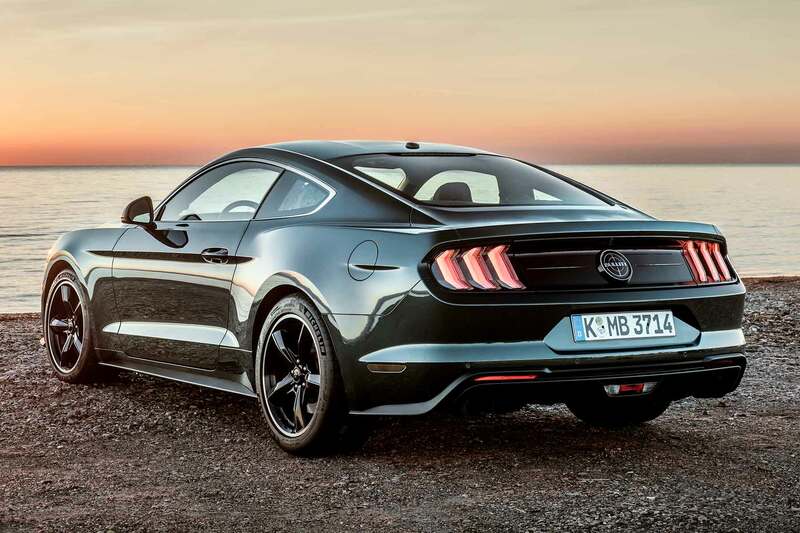 The net result, though, is a Mustang that does stand out from the regular GT coupe. 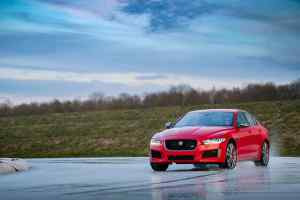 The mechanical changes, what there are, are designed to give the driver a more scintillating experience behind the wheel, rather than make an already very fast car even faster. So there’s a modified induction system readily apparent when you open the bonnet, the air filter is bright yellow and the plastic cover over the engine is removed – so you can see the V8 in all its glory. 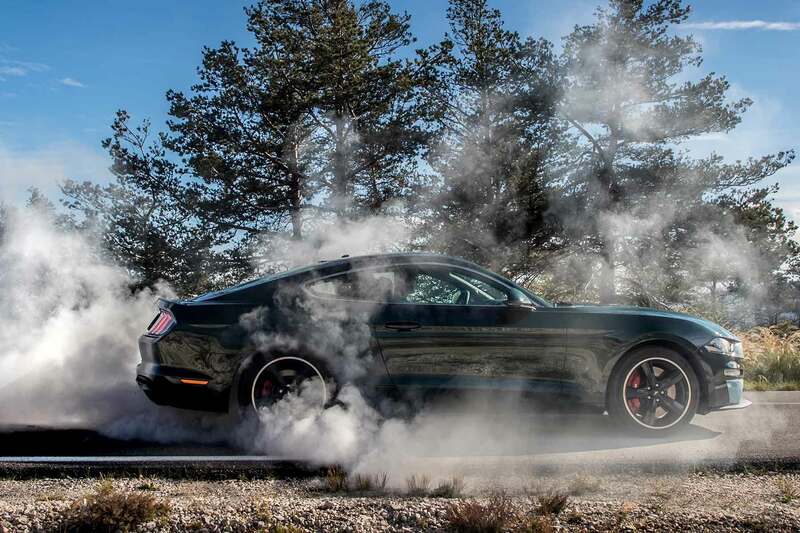 The exhaust offers a choice of four noise levels; apply the ‘Race’ setting and your 2018 Mustang will sound exactly like McQueen’s. While that’s anti-social on one level, get away from built-up areas and this is pure schoolboy fun. It bellows and pops along in a manner that can’t fail to delight, even before you approach any speed limits. 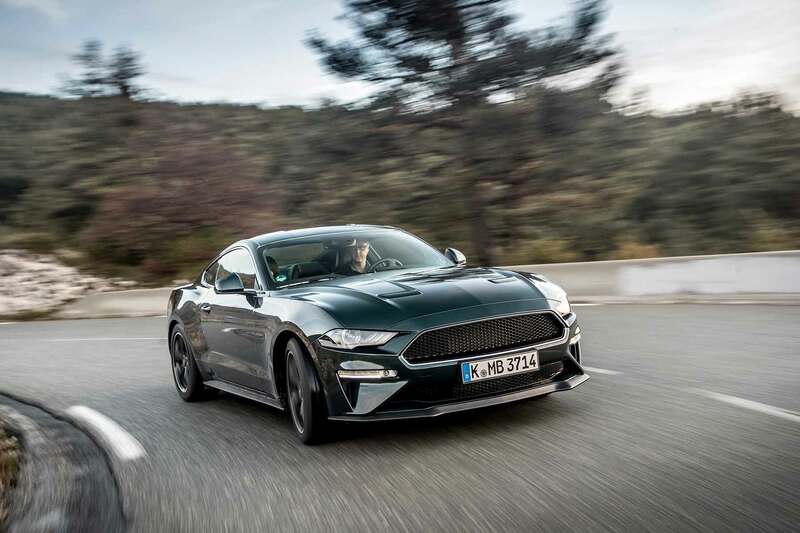 A total of 460hp is a handy amount to have under your right foot, and the Mustang Bullitt is prodigiously quick – even when the exhaust noise is dialled back (some hope). You can, of course, leave black rubber marks down the road, although not too often unless you have an unlimited budget for rear tyres. For many drivers, we suspect, this will be enough. The triple whammy of high-impact visibility, a noisy V8 and stonking acceleration brings the benefits of a supercar costing four times as much. 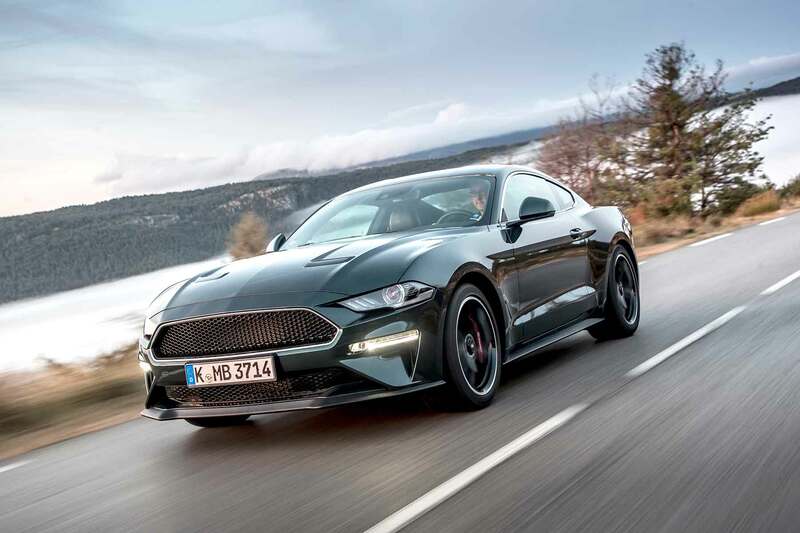 Yes, the Mustang Bullitt costs less than £50k, a veritable bargain for a car that will reach 163mph and 60mph in 4.6 seconds. It also comes with a rather good 1000w B&O sound system, some very comfortable Recaro seats and a dashboard plaque with the unique build number of your Bullitt. There’s more, much more, though. Find the right road, like the Route Napoleon in southern France – an oft-deserted oasis of fast, open bends suddenly running into tortuous hairpins – and the Mustang can really surprise. There’s the grip, loads of it, forcing you hard into the side of the seats. But there’s also a poise to the chassis and accuracy to the steering that makes the experience very involving. Pick the Magneride suspension, a wholly desirable £1,600 option, and there’s a good compromise for every road surface. The fly in the ointment, arguably, is the manual gearshift. 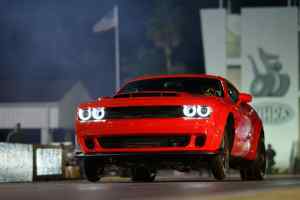 It’s heavy and it takes time to learn how to engage the meaty clutch smoothly. On the upside, the Mustang comes with ‘rev-matching technology’, which automatically blips the throttle as you downshift – it sounds like you’ve achieved the perfect change every time. 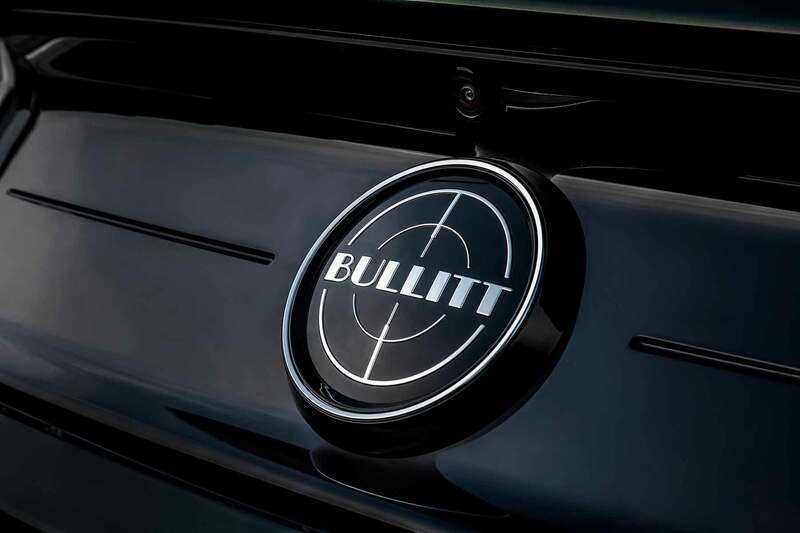 The UK allocation of Bullitts has sold out for 2019, although they are already appearing in the classifieds for a £10k premium. Personally I’d rather wait until the next batch arrives, which may well have the ten-speed auto ’box as an easier-to-live-with option. Alternatively, you could simply get a regular Mustang GT V8. Like my Canadian renter, it comes as a desirable convertible, too. And that’s quite a car in its own right.